I've been working on preparing an upcoming public radio program for this Saturday (11/13/10), the second show that will feature again Joe Frazier of the Chad Mitchell Trio, Art Podell of the New Christy Minstrels , myself (variously described in the promos as "folk blogger," "folk musicologist," "member of the Chilly Winds," "folk historian," and other less complimentary sobriquets) - with the welcome addition this time of none other than George Grove of the Kingston Trio. Since I got to help organize the show (the actual producer and on-air host most weeks is Mary Katherine Aldin, who produced thirty CD/albums from the Vanguard tapes of the Newport Folk Festival in the 50s-60s, including 1993's The Kingston Trio: Live At Newport) - I nominated as the theme the music of 1963, a pivotal year in the careers of Joe and Art, for folk music and the nation in general as well. Each of the four of us will take about a half hour to present a selection of the music that Joe and Art were involved in making that year and that George and I were listening to. It occurred to me that without stepping on the toes of the show itself and publishing our song list, I could present here this week a sort of parallel set of songs and videos, most of which are not actually to be featured in the show, but that make a fine set of songs to listen to anyway. I will say that not surprisingly Joe, Art, and George have each cited the cataclysm of November 22, 1963 as central to their memories of that year - and for who of us alive at the time would that not be so? Some of the songs they have selected for the NPR show are related to that event, and like many others I have always believed that the Kennedy assassination was the death of a kind of American optimism and innocence from which we have never completely recovered, the day "when they blew the dreams away," as John Stewart wrote. The chorus as written by the great Hoyt Axton, of course, went "I don't give a damn about a greenback dollar" - a line deemed objectionable by the wise old suits at Capitol records, who insisted that the "damn" be replaced by the guitar strum that you hear here. The cut on the KT album New Frontier included the real lyric; the video above is an upload of the 45rpm single version. This show was broadcast on VARA TV in the Netherlands, reflecting the international popularity of the U.S. folk revival. Folk music also had its short-lived moment in the primetime limelight of American television with the April 6, 1963 debut of ABC's often schlocky Hootennany broadcast. Though there were some really great performances in the season and a half of that show (many of which, including the ones below, appeared on the recently-released DVD collection), the suits at ABC decided to observe the blacklist of Pete Seeger and refused to put the godfather of American folk music on the only network show ever broadcast that was putatively devoted to the genre. This led to a boycott of Hootenanny by the three biggest names in folk show business at the time - the Kingston Trio, Joan Baez, and Peter, Paul and Mary - as well as a goodly number of other folk performers as well. It is worth noting, though, that while Seeger appreciated the support generated by the boycotting groups, he in fact urged folk performers to go on the show, believing as he said that any exposure of folk music to the mass American audience was a good thing. That explains why good friends of his like Theo Bikel and admirers like Judy Collins and the Chad Mitchell Trio felt comfortable to appear on the show even while they objected to the blacklisting. I'd have to describe this as "bubble-gum folk," really catchy and well-performed - but if you chew on it too long.... The song has always been a pleasure for me akin to reading a good potboiler novel - totally engrossing for as long as it lasts. Bob Gibson: "Where I'm Bound"
The Tarriers were also on that show, and yes, that's the great Eric Weissberg (later of "Dueling Banjos" fame) sitting behind Gibson and noodling along on the mandolin. 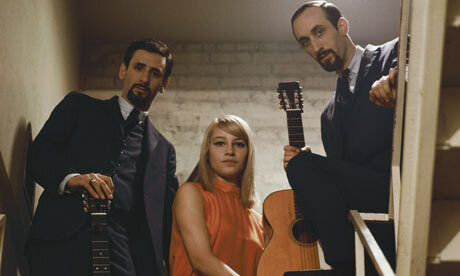 Any discussion of folk music in 1963, though, has to climax with the phenomenal success of Peter, Paul and Mary, who that year surpassed the Kingston Trio as the leading sellers of folk albums in the U.S. While the Kingstons had remarkable overall longevity (their debut album spent an astounding 195 weeks on the Top 200 charts) - PP&M's debut album spent 84 weeks in the Top Ten and was joined for a period of time there by their next two albums, Movin' and In The Wind, both of which were released (early and late) in 1963. They also performed a lovely version of "Blowin' In The Wind," but the only video on YouTube of that performance is absolutely ruined by commentary inserted over and interrupting what should have been an archival recording of one of the most sublime moments in the history of American music. Hi, I found your page doing a search about some performers from that time. Unfortunately by now (April 2014) many of the videos you posted have been taken down, and one is marked "private". Could you at least identify the names of the songs and the performers, so that someone interested could still get benefit from your page? Thanks so much! Thanks for the alert, and sorry for the delayed response. Real life issues have kept me away from the blog for a while. I have made reasonable substitutions as much as possible, though the NCM video clearly has the studio track of "Green,Green"laid down under the actual video from the TV performance, The Journeyman version of "No One To Talk My Troubles To" cannot be replaced at this time, and the PP&M at the Washington March is a different and flawed video. The deleted Bob Gibson number with Eric Weissberg was "Good News, Chariot's A-Comin'." I hope that helps, and thanks for the interest.